The tech will let you enhance your body from the inside out. Everywhere you go, you can find scientists and engineers doing 3-D printing. They may be using it to print bridges over water, or buildings and houses, or even hearts and livers and skull parts. In fact, we’re hearing so much about 3-D printers creating the normal and ordinary stuff all over again, that it’s becoming pretty boring. This, of course, is how technology makes progress: slowly, and with iterative changes being added all the time. We’re currently using 3-D printers just to create all the old stuff, which we’re used to. The makers and creators are mainly interested today in demonstrating the capabilities of the printers, and put less emphasis on actually innovating and creating items that have never existed before, and of course, the clients and customers don’t want anything too extraordinary as well. That’s the reason we’re 3-D printing a prosthetic ear which looks just like a normal ear, instead of printing a Vulcan ear. What happens if we let go of the ordinary and customary, and begin rethinking and reimagining the items and organs we currently have? That’s just what Manu S. Mannoor, Michael C. McAlpine, and their groups did at Princeton and Johns Hopkins Universities. They made use of a 3-D printer to create a cartilage tissue the shape of a human ear, along with a conductive polymer with infused silver nano-particles. The end result? A bionic ear that should look and feel just like an ordinary ear, but has increased radio frequency reception. It is not far-fetched to say that Mannoor and McAlpine have printed the first biological ear that could also double as a radio receiver. Radio-conductive bones: have you come for a hip replacement, and also happen to have a pacemaker or some other implant? The researchers will supply you with a hip-bone printed specifically for you, which will also contain conductive elements that will aid radio waves go deeper into the body, so that the implants can receive energy more easily from the outside by radio waves or induction of some kind. Drug delivering tattoos: this item is not 3-D printed, but it’s still an intriguing combination of a few different concepts. Tattoos are essentially the result of an injection of nano- and micro-particles under the skin. Why not use specific particles for added purposes? You can create beautiful tattoos of dragons and princesses and butterflies that can also deliver medicine and insulin to the bloodstream, or even deliver adrenaline when pressed or when experiencing a certain electrical field that makes the particles release their load. Now here’s a tattoo that army generals are going to wish their soldiers had! Exquisite fingernails: the most modern 3-D printers come with a camera and A.I. built-in, so that they can print straight on existing items that the user places in the printer. Why don’t we make a 3-D printer that can print directly on fingernails with certain kinds of materials? The fingernails of the future – which will be printed anew every day – might contain tiny batteries that will power smartphones by touch, or microphones that could record everything that happens around the user. 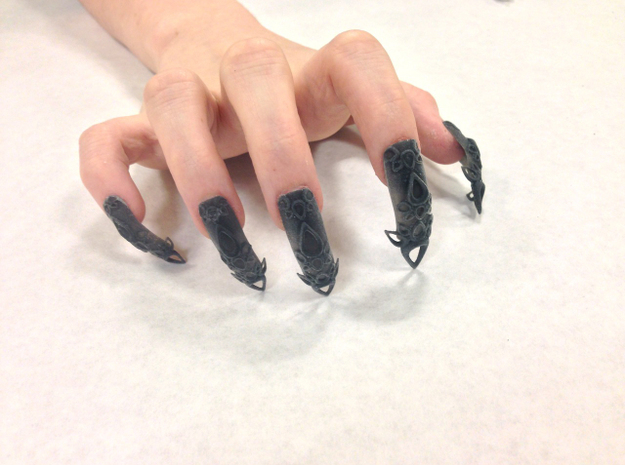 3D printed fingernails by TheLaserGirls. Offered for sale on Shapeways. These are obviously just three rudimentary ideas, but they serve to show what we could gain by leaving behind the idea that new manufacturing technologies should adhere to the “old and proven,” and advance ahead to novel utilities. In the end, the future is never just “same old same old,” but is all about shedding off the customs of the past and creating new ones. And so, if I had to guess, I would wager that such a unification of concepts into new and bizarre devices would give us a much more accurate view of the future than the one we gain in the present by showing how 3-D printers can build yet another house and another human organ. What are your ideas for future combinations of biological and synthetic components? Write them down in the comments section!